Let your dancing gal know you think she's wonderful, whether she's the lead in every production or is happy just being part of the show. 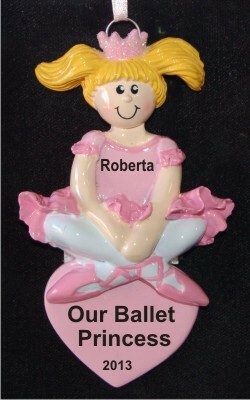 The ballerina princess blond personalized Christmas ornament offers a sweet design along with the opportunity to create a keepsake she'll always treasure. When you give us her name and the sentiment you'd like to see on it, one of our artists will add them by hand in pretty lettering. These dance ornaments personalized by hand arrive in our plush velvet gift bag ready to display on the tree or other favorite location. Show your admiration for her hard work and success with the pleasantly pink blonde ballerina personalized Christmas ornament.